Pros: Joyous singing, witty dialogue and wonderful music. Cons: For a musical about gay rights, it seems strange to prioritise heterosexual romance. 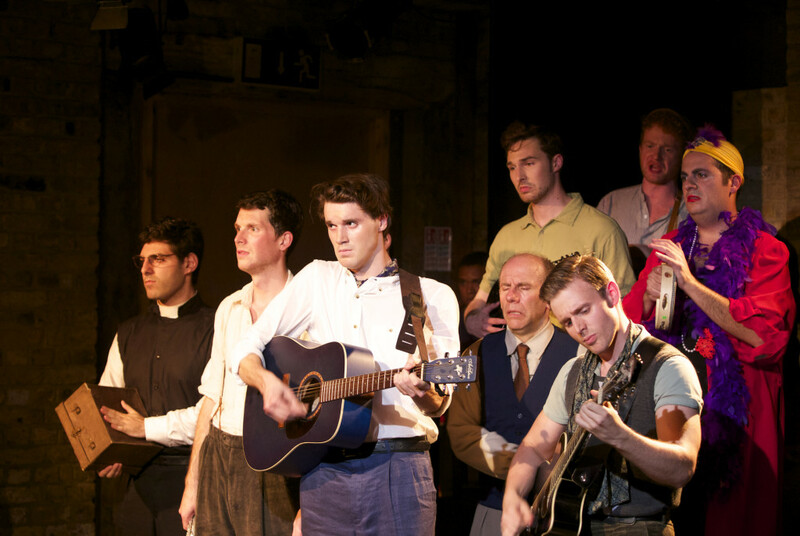 A strong cast delivers an inventive, engaging and truly interesting show. I wasn’t the happiest of bunnies when I realised I had to trek across London after giving blood yesterday to go see a show by myself. I was even less amused when I saw the Arcola’s bar prices and their poster asking for sustainable wood donations – yep, I was definitely in Dalston. As I squeezed into my seat in the packed and stuffy basement studio, I wasn’t exactly dying of excitement but I felt very differently when I left. 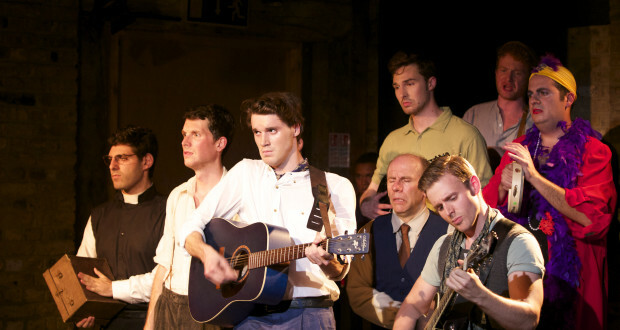 San Domino mainly takes place in 1930s Italy and follows a group of friends who are rounded up at a gay bar. They’re sent to San Domino, a penal colony Mussolini set up to ‘cure’ gay Italians. Put a load of gay men on an island together and they will surely turn straight: good thinking on the part of Il Duce. Right away, thanks to the strength of the performances, we feel part of the gang, sharing in their jokes, triumphs and pain. The incidental music in this show is just as strong as the catchy and often beautiful songs. The actor-musicians, who deftly switch instruments mid-song without missing a beat, help create a fluid feel that make the songs feel organic and less stagey. There are no weak links in the cast and it’s hard to single out anyone’s performance. Nicholas Chiappetta’s vocal performance as Antonio is devastatingly good, although his acting occasionally veers into the hysterical. Mike Christie also impresses as Claudio, the group’s moral compass. There is something about Christie’s stage presence that is completely captivating and when he and Carlo, Matthew Hendrickson, share a tender moment in the duet Love Should Be So Easy you could feel the whole audience – male and female, gay and straight – fall in love with Claudio. The main criticism I have of this otherwise strong show is that it focuses too heavily on the heterosexual romance in the story. The irony of imprisoning gay men on San Domino is that they no longer had to hide who they were, and instead of changing their sexuality, the camp meant they were freer to explore it. 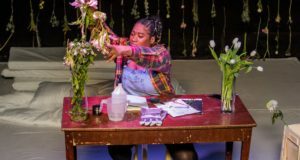 Though the play highlights this, it never fully exploits it, choosing to rush through a few gay romance plotlines, most of which are dominated by tragedy, violence and self-loathing. To me, this felt like a missed opportunity to show that despite the fascists’ prejudices, gay relationships can be just as happy and healthy as straight ones. Also, the show is bookended by two modern day scenes that take place when gay activists visit San Domino to remember the suffering endured by the prisoners. The purpose of these snippets is clear: to show how far we have come and how far we still have to go, but they both feel a little forced. The historical narrative speaks for itself, along with the very current and very real anti-propaganda that is distributed to the audience before the show. The message comes across in the main bulk of the story, and the present day scenes feel flat in comparison. These criticisms aside, the show is entertaining and clever and took us completely into the heart of the torment these men experienced. 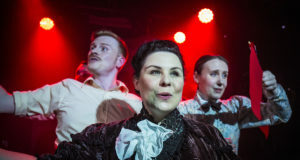 If you’re looking for a musical that offers something different than the cheesy West End fare, but where the cast is just as talented and the music just as accomplished, gather up any spare sustainable wood you have and head over to Dalston. One final warning though: remember that you’re really going to San Domino, so dress for the Italian summer and bring some extra lira for the bar bill – this show is worth digging into your pockets and getting a little hot and bothered for. Booking Information: This show has now completed its run. Visit www.facebook.com/SanDomino for touring locations.